Today, I will introduce you to the wonderful world of semicolons! The semicolon is among the top misused punctuation marks and remains a mystery to most people. But no longer! Only four rules for semicolons exist – and they are easy to follow. Use a semicolon to replace a period. Sometimes, you may write two complete sentences (sentences with a subject and a verb) for which a joining comma is too weak. That is, the two sentences really do belong together, but they need more emphasis than a mere comma. Alternately, in order to avoid short sentences, you may not want to use a period. Instead, you can use a semicolon. Alzena’s limbs were still too battered to continue the journey to Fugglestone; breathing hurt her ribs, and her left leg still lay mangled from the attack by Count Osric’s dogs. In this example, each sentence is a complete thought, but because they complement each other, I’ve put them into one sentence. 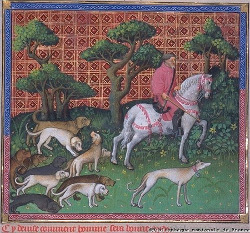 Count Osric’s dogs mysteriously appeared whenever anyone attempted to cross his lands; therefore, some peasants claimed that they were spirits. This example contains two complementary but complete thoughts joined by “therefore.” Thus, I separated them with semicolon. When you are listing items in a series and one or more of the items must contain a comma, then use a semicolon to separate the items. For example, say you are listing the names and sires of Count Osric’s dogs. The name of each dog and its sire are separated by a comma. You must, therefore, use a semicolon to sort the information out, or you’ll end up with a mess. But the superstitious Peterkin swore that demons had sired Count Osric’s dogs and would name their fathers. He knew all of the count’s dogs – Lazarus, son of Abaddon; Uriel, son of Belial; Herne, son of Moloch. In the above example, if I had not separated the name and parentage of each dog with a semicolon, the reader would be forced to mentally separate each unit in the sentence. Why make your readers work when a simple punctuation mark does so for them? Separate two complete sentences joined by “or,” “and,” or “but” when the first sentence contains commas. This is not required, as you can use a simple comma, but as with the previous rule, using a semicolon can simplify the sentence for your readers. What does this mean for Alzena and her ruined leg? Let’s see. A pilgrimage to the holy shrine near Foulpapple, where the goddess Myrtis was said to stir the waters, would heal her destroyed leg; but how could Alzena escape the count’s guards? Both sentences are complete thoughts, and the first sentence contains a comma. Therefore, just to sort out the clauses, I used a semicolon to introduce the second sentence. Semicolons, as you can see, are not very mysterious at all. Just as with any other facet of grammar, it’s only a matter of knowing a few rules and applying them to use the semicolon correctly. Ah, the colon. After the comma and the semicolon, the colon is probably the most misused punctuation mark we have. Today, I present a quick and dirty lesson on this strange little mark. Enfido always carried the following necessities: his grimoire, a vial of fast-acting poison, and a bottle of uisce. What you should also notice about the above sentence is that I did not use the colon to separate the verb (carried) from its object (necessities). The clause preceding a colon must always, always be a complete sentence. Thus, though I might have wanted to shorten the sentence to read, Enfido always carried: his grimoire, a vial of fast-acting poison, and a bottle of uisce, this would be incorrect, leaving carried without an object. Enfido saw through the beggar’s disguise: the “beggar” bore the tattoo of the Brotherhood on his inner wrist, just as Bawdler did. In the above sentence, the colon introduces how Enfido recognizes his old brother-in-arms, thereby summarizing the first clause. That’s it! Those are the two uses of the colon. Not so mysterious after all, is it?